January 15, 2019, 12:23 PM · In an effort to promote the coverage of live violin performance, Violinist.com each week presents links to reviews of notable concerts and recitals around the world. Benjamin Beilman performed Vivaldi's "Four Seasons" with the Cincinnati Symphony Orchestra. Cincinnati Business Courier: "The violinist was a dynamic presence in Vivaldi’s picturesque concertos...He tackled the virtuosities of "Summer" with fire, dash and breathtaking ease. The sustained heat of its central movement was vividly portrayed." Leila Josefowicz performed Stravinsky’s Violin Concerto with the Toronto Symphony Orchestra. The Star: "Josefowicz was an electric presence, doing things with her bow that might put many other virtuosi to shame." Ludwig van Toronto: "Josefowicz is the violinist of the future who can blend Stravinsky’s multiple compositional characteristics into a compelling story, and she makes you eagerly want to find out what she’s going to make happen next." Augustin Hadelich performed the Sibelius Violin Concerto with the Toledo Symphony. 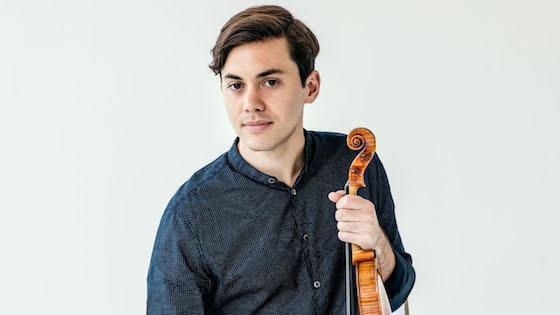 The Blade: "Hadelich is a consummate performer with a lyric tone, fiery technique, and a musical sensitivity that has earned him honors the world around as one of the outstanding violinists currently performing. His interpretation of the Sibelius lived up to his reputation: sweeping lines, clean technique, and musical sensitivity that could be called nothing less than beautiful." Nikki Chooi performed Sibelius’ Violin Concerto in D Minor with the West Virginia Symphony. Charleston Gazette-Mail: "Chooi played with the required subtlety and rhythmic precision while essaying lithe melodies and bracing passage work. His tone had a dark creamy core in the opening movement but he let it blossom radiantly in the middle movement and finale." Bella Hristova performed the Mendelssohn Violin Concerto with the Winnipeg Symphony Orchestra. Winnipeg Free Press: "Her pitch-perfect intonation and seamless phrasing proved she had this masterwork well in hand, as she proceeded to perform the three-movement piece with a focused intensity and plenty of dramatic flair." Pinchas Zukerman performed Bruch's Violin Concerto No. 1 with the New World Symphony. South Florida Classical Review: "His violin technique remains formidable, his bow arm steady, his intonation accurate....This timid choice of repertory, combined with a performance that often seemed emotionally detached, gave the impression that the great virtuoso was coasting."